Upgrading the firmware of your Linksys RE6250 AC750 Wi-Fi Range Extender improves your range extender's operational functions and fixes software issues found in the previous version. 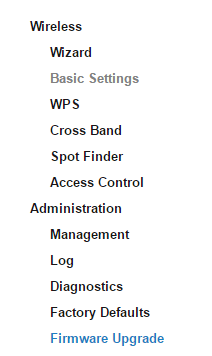 Open a browser to log in to the web-based setup page of your range extender. NOTE: You must be connected to the SSID of the range extender. ​A. Enter "http://extender.linksys.com" in the Address bar. B. Enter "http://RE6250" for Windows® or enter "http://RE6250.local" for OS X® in the Address bar. 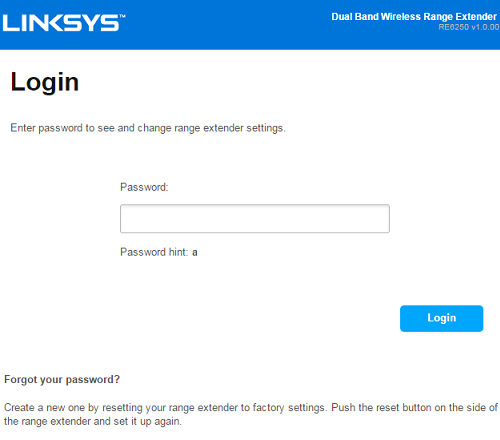 NOTE: If you have changed your Linksys RE6250's name, then use that custom name instead (e.g. "http://MyAP"). NOTE: If the range extender does not detect a DHCP server, the default IP address is 192.168.1.1. Otherwise you will need to look up your range extender’s IP address in your router's DHCP Client Table. To know how to do this using a Linksys Wi-Fi Router, click here. If you are using a Linksys Smart Wi-Fi Router, click here. Enter your range extender's admin Password. If you have changed your password, enter that instead. Otherwise, enter the default password “admin” in the field, then click Login. On the web-based setup page, click Firmware Upgrade under Administration. There are two methods in upgrading. The range extender will automatically detect if there is a new available firmware. 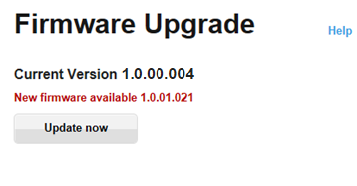 If there is, click the Update now button to start upgrading the firmware. If you would like for future firmware files to automatically update, check the Auto update range extender when improvements are available checkbox. IMPORTANT: Make sure you have downloaded the firmware file from the Linksys RE6250's Download page first. To manually update the firmware, click the Select a file button and select the firmware file that you have downloaded, then click Open. To start upgrading the firmware, click the Start Upgrade button. The progress of the upgrade process will be shown on the same page. To prevent any problems with the range extender, do not interrupt the upgrade process.